Because it is impossible to predict which acute myeloid leukaemia (AML) patients will benefit, all patients are routinely treated with chemotherapy although only some will respond to the treatment. Researchers from Goethe-University Frankfurt have now discovered a novel biomarker that enables the detection of therapy responders and non-responders with high accuracy. In addition, their research reveals new hope for patients who currently cannot be effectively treated. The anti-cancer drug cytarabine provides the basis of chemotherapies directed against AML. Cytarabine needs to be activated in cancer cells by the addition of phosphate groups to exert its anti-cancer effects. Prof Jindrich Cinatl (Institut für Medizinische Virologie, Goethe-Universität, Acting Director: Prof Volkhard Kempf) investigated with his research group (funded by the Frankfurter Stiftung fürkrebskranke Kinder) cytarabine-resistant AML cells from the Resistant Cancer Cell Line (RCCL) collection (www.kent.ac.uk/stms/cmp/RCCL/RCCLabout.html) that he runs together with Prof Martin Michaelis (University of Kent, Canterbury, UK). ProfCinatl discovered that the toxicity of cytarabine against AML cells correlates with the expression of the cellular enzyme SAMHD1, which enables to predict the sensitivity of AML cells to cytarabine. Following this initial finding, a consortium led by Prof Cinatl together with Prof Oliver Keppler (who moved from the Institut für Medizinische Virologie, Goethe-Universität to Ludwig-Maximilians-Universität, München during the project) showed that SAMHD1 removes the phosphate residues from the active form of cytarabine and thereby reverses it into its inactive state. 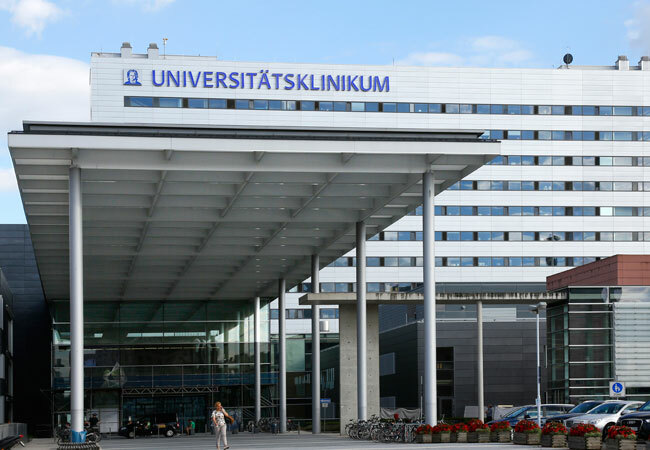 In a cooperation with clinicians (led by Prof Hubert Serve, Medizinische Klinik II, Goethe-Universität) it was shown that SAMHD1 levels determined in leukaemia cells also enabled the prediction of the response of AML patients to cytarabine-based chemotherapies with high accuracy. This introduces SAMHD1 as clinical biomarker that can guide cytarabine-based chemotherapies only to such patients that are very likely to respond and spares patients who are unlikely to respond from toxic side effects. In addition, the Frankfurt-led team showed that inhibition of SAMHD1 effectively sensitises cytarabine-resistant AML cells to cytarabine-based chemotherapies, opening future prospects for the treatment of patients for whom currently no effective therapy exists.